Christine E. Ray is a writer and freelance editor who lives outside of Philadelphia, Pennsylvania. Her writing has been featured in SpillWords, fēlan poetry & visual zine, Nicholas Gagnier’s Swear to Me (2017), Anthology Volume I: Writings from the Sudden Denouement Literary Collective (2018) and will appear in Gagnier’s upcoming All the Lonely People. Christine fell in love with writing poetry in her 50s . It is her therapy, diary, and confessional. It is deeply personal, deeply human, and relatable. Christine E. Ray's Composition of a Woman is a compelling collection of poetry that focuses on a stimulating subject: woman. Composed of five chapters titled Nerve, Brain, Breast, Rib and Blood, this collection is stirringly sincere. Nerve is playful and humorous; 'the transformation/was so slow/so gradual/that I was unaware/that bones had turned glass/' from the poem The Lost Key. In stark contrast, it is followed by the fittingly melancholic and despondent poems of the section on Brain. And as we sadly view the broken pieces of a woman around us, the tactile and sensuous poems in Breast slowly start by stirring our hearts and reminding us of that woozy and wobbly feeling of being truly in love. Nostalgic and lonesome, the Rib poems are both painful and beautiful while the poems in the final chapter called Blood try to unify the kindred spirits with an enigmatic smile. Composition of a Woman by Christine E. Ray is a book of poetry and prose written by a woman about women. Christine Ray certainly has something to say and she's saying it in a voice that is unique, humorous and provocative, also poignant. It is an extraordinary voice that describes, dissects and debates the quintessence of being a woman, that beautiful creature that can be vulnerable or powerful, but always beautiful. And while we go on a fascinating journey in a woman's mind, body, and soul through these poems, the experience is thought provoking and fascinating, like every woman should be! Composition of a Woman is written by independent author, poet, and blogger, Christine E. Ray. Ray is known for her website Brave and Reckless where she blogs about poetry, writing, and fiction. In her book, Composition of a Woman, Ray puts forth her personal life experiences for her audience. The poems are broken up into five different sections: Nerve, Brain, Breast, Rib, and Blood. Each section revolves around a specific subject, for example, Brain delves deep into the emotions and effects of mental health and depression. Meanwhile, Breast covers the subject of love and romance. Some poems are light hearted, while others are weighed down by their context. “It is a revelation as if I have never heard my name before,” is a line from Ray’s poem Amen. The poem is about the uncertainty that comes with romantic love, something many of us can relate to. With every word written, I feel as though Ray is not only sharing her life experiences as a woman, but telling the untold and sometimes silenced stories of other women as well. Composition of a Woman is a beautiful book that any woman will be able to pick up, read, and relate to. Despite how dark it can get, it does not paint women as weak; it portrays vulnerability and the strength within us. I implore women of all ages to read Christine E. Ray’s Composition of a Woman; it will leave you feeling a wave of relief, as though at last there is someone out there that has walked many miles in your shoes and truly understands. Composition of a Woman by poet and author Christine E. Ray is a brief yet all-encompassing read. There is the same sort of steady but resigned narrative voice from the beginning until the end that creates this amount of comfort between the reader and the author that isn’t pulled off by many to this degree. A particular favorite poem is “A Suitable Period of Mourning,” which calls to attention our own loss of identity as a wife or daughter when those significant figures are no longer with us. Composition of a Woman has a way of sticking with you and transforming your day into another perspective. You gain a lot from its words. 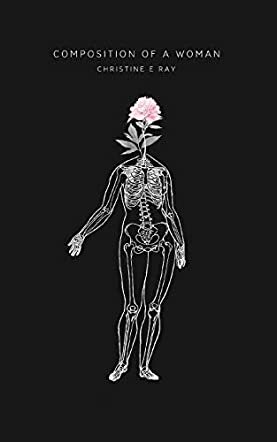 The poetry collection is broken into five parts, nerve, brain, breast, rib, and blood, and centers around a lot of what feels like the narrator’s body deteriorating before her very eyes. Christine E. Ray’s Composition of a Woman successfully brought me into the subject matters that were touched upon. Specifically, there are a number of poems that focus on the narrator’s body ailments in such a way that you feel as though you have a front row view of what sickness can mean for one individual and how that person is affected. And not just problems with the body, but the change that all women go through as they age. In a poem titled “Seed,” the lines “since monthly ruby tides/synced to moon rhythms/have ceased” show readers how a woman might feel affected by that natural process and how others might wrongly view her. You really feel as though you bond with the narrator in all kinds of ways, especially if you are a female reader. I would definitely recommend this book to women of all ages and men as well, who might be able to connect with women better or with their own feminine energy in a way that could strengthen them as a person navigating the world itself. Composition of a Woman by Christine E. Ray is a poetry collection that expresses the thoughts, memories, and emotions of a woman and from a woman’s perspective. This book is a rich read and there is a lot of content in it. The book is loosely organized into sections—each denoting an organ or component of the human body—nerve, brain, breast, rib, and blood, which correspond to certain emotions and aspects of life, and contain several poems that elaborate on each particular theme. The poems deal with joys and sorrows, particularly pertaining to a woman’s life, mind, and, body. The themes of loss, separation, pain, and heartbreak are portrayed as part of this collection along with the joys of friendship, solidarity, love, and peace. This collection of poems is essentially a part-memoir of Christine’s own experiences of life and loss, and the way in which she handled and coped with challenges in life. Composition of a Woman is a raw composition of poetry that simultaneously showcases the strength and power of a woman as well as her weakness and vulnerabilities. Any woman would be able to identify with these themes, and in that sense the book is very relatable. It struck me as showing how women in general carry far more of a burden than men, whether is through pain or sacrifice, and this is what came through in this book for me. Christine’s writing style is open and candid, and I especially liked some of the poems such as “Black Roses and Moonlight,” What little girls are made of,” and “Diving Deep and Surfacing,” among others. This is a good book for fans of the poetry genre.